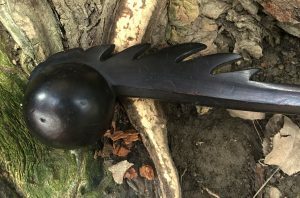 A favorite weapon of the Eastern Woodland Indians was the ball headed war club, also called burled ball club as they were made from the root burl commonly made from maple, ash, hornbeam (ironwood), all hardwoods. Even after the Whites brought in iron tomahawks, these war clubs remained a favorite. Some were carved into animal effigies normally depicted as holding the ball in its mouth. They were decorated with iconography of spiritual beings that were important to the owner. This fin back ball club took on a shape of possibly the spine of a fish, possibly a large pike or sturgeon. This club also has a lanyard hold that holds a rawhide thong or cordage to be wrapped around the wrist to ensure a sturdy grip of the club. This war club takes on its dark color because it was made from a cherry root burl and was rubbed down with bear oil, another favorite of the Native American Indians.